After sketching old Chinese jade cicadas at the Field Museum last week (see previous post), I was inspired to sculpt one myself. I had a chunk of leftover “faux jade” polymer clay from a project this past spring that I thought would work perfectly. Here’s the sketch, real Canadian jade beads, sculpted polymer cicada, and “jade” polymer clay. Enjoy! Your polymer cicada looks just like the real jade! Amazing work, Karen! And a nice green for Christmas—have a happy holiday! Thanks, Heather! Merry Christmas to you too! 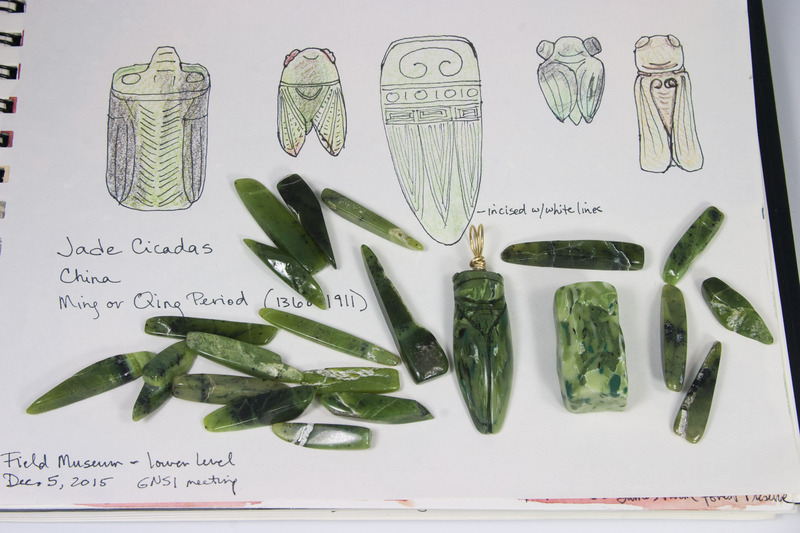 I love the way you’ve put the beads, the cicada and the clay together with your sketches. Beautifully sculpted cicada too! Happy Christmas Karen! Thank-you Karen and the same to you. Your jade cicadas are lovely. I know Christmas is not a Chinese holiday, but the jade green is perfect for the season. Karen, your blog is awesome!